If you are looking for a relaxing getaway in the heart of the beautiful Kenai Peninsula, look no further. Our Awesome Log Cabin Retreat is located on a magnificent 2 acre lakefront property! Just off the Sterling Highway nestled in a magnificent setting. It is secluded, yet within easy access from Soldotna, just beyond the city limits (less than a mile from Fred Meyers). The cabin has been decorated to make you feel warm and cozy, even on a chilly Alaska evening. Full log construction and knotty pine interior give a rustic feel. This wonderful log cabin sleeps 4-6 comfortably, with a downstairs kitchen, bedroom, bathroom, living area, and an upstairs bedroom and loft. This lake front setting is simply awesome. A fully equipped kitchen with dining area provides everything you need for a week on your own. But if cabin fever sets in, there are several quaint restaurants within just a few miles and numerous shops to explore in Soldotna and Kenai. With the Kenai River just minutes from your front door, you are sure to catch a keeper and have great fish stories to tell back home. We are 3 good friends, Jack, Jeff, & Martine that love to fish in Alaska!!! We built the cabin ourselves back in 2004. We have always enjoyed the natural beauty of Alaska and we wanted a place that we could come up and enjoy - that was close to the world class fishing! Over the years, we've pulled out so many incredible salmon out of the Kenai River it's unbelievable. We're in a secluded spot on the lake, but we're still so close to town that it works out well for everyone. 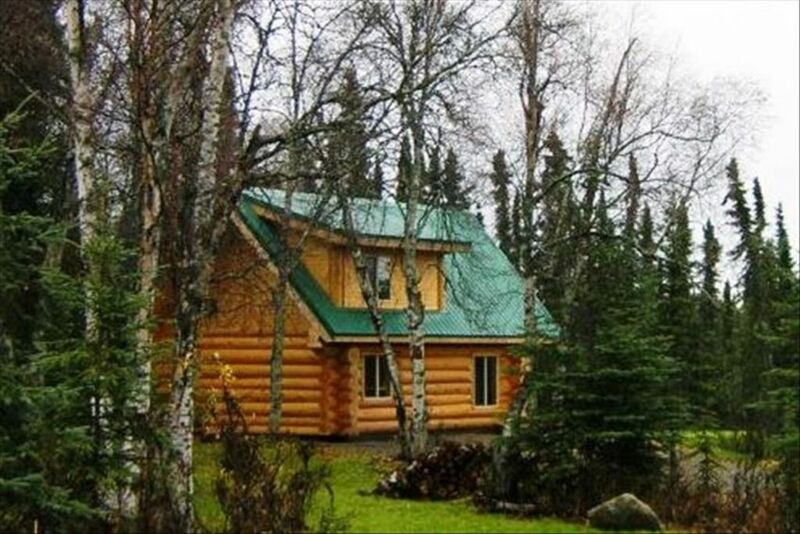 On a private lake, but only 1 mile outside of Soldotna and very close to the Kenai River. Chest Freezer for Fish on small deck at the back of the cabin. Stay connected with complimentary Wireless Internet! The Cabin was nice and suited our needs very well. We enjoyed our time in Soldotna. There are so many interesting places to explore! This cabin made our family vacation a wonderful place to stay. It was very clean & stocked with everything you need. The views were stunning. We even saw caribou on the other side of the lake. I will definitely be looking to stay here again on our next trip to Alaska. Secluded enough to not even know you’re so close to town to get what ever you need. Looking forward to the next trip! The cabin worked out perfectly for our family of 5. We have 3 teenagers. After a full day of activity, it was great to come back and have enough room to spread out. The location was ideal. We were close to the salmon and only a couple of hours from Seward and Homer. We did it all from this great central location. Great place; very close to town. We chose to stay in Soldotna being it was centrally located to many of our fishing excursions and the cabin was very nice and comfortable close to many stores, restaurants and bars. It was great having you and your crew stay at the cabin. I am really glad you enjoyed it and hope to see you guys come back soon. And Jack was wonderful to work with. Very accessible and helpful. The only complaint I heard was that there were no fish to be had in the lake! Wildlife viewing right in front of the cabin!